This is a FRIDAY TO FRIDAY RENTAL (easier to get boat reservations). Private home, not just a rental house. NEWLY RENOVATED, beautiful bed linens (ironed for you - beds made for arrival). House is immaculate. Located on a private lane, covered with shells. Just 8 summer homes in this quiet neighborhood. Traffic is minimal and a safe place for children rather than traffic on an in-Town street. A short 5 minute walk to historic Main Street, past whaling captain's houses to quaint shops and restaurants. Guests and teens feel independent to walk or bike from this location. Also, an easy walk with a baby carriage or for elderly family mambers. Many beaches nearby via easily accessible bike paths to Surfside, Cisco or Madaket beaches. Four beach chairs are provided along with a beach umbrella and beach towels for the entire family. Entire yard is surrounded by 6 foot high privet hedges for privacy with arched hedges on every entry. Sweet perennial garden, edged with boxwood with bird bath amongst white impatients, cosmos, lilies and blue hydrangeas. Yard has a few chairs under an umbrella for easy reading or relaxing. Outdoor shower to rinse off from the beach or enjoy in the morning listening to the the birds. Three pairs of cardinals and their summer offspring inhabit the property. New mahogany deck covered with a white bead-board cathedral ceiling with a clay-beaded chandelier and a cushioned porch swing allowing you to enjoy being outside no matter what the weather. Wicker dining table on porch with 4 cushioned chairs. Gas grill. Many extra amenities provided by the owner as it is a year-round home. Decor is coastal "shabby-chic" in white with turquoise/seafoam green accents. Bright and sunny, mix of modern and antique furniture, accented with crystal chandeliers and mirrors. Living room couch and chairs are slip-covered with washable white fabric. Child friendly. AC throughout. and new floors throughout downstairs. Eat-at counter with 4 high-top chairs. DINING ROOM: Located just off of the kitchen with white table (with leaves to seat up to 10) and chairs. Silver chandelier with driftwood woven throughout its arms. MASTER BATH AND BEDROOM: Located on the first floor with white, high gloss floor. New marble bathroom with an open glass, walk-in shower. UPSTAIRS: Stairs to second floor are painted in a white, high-gloss marine paint. Beachy and beautiful. Three bedrooms (1 with 2 twin beds and two with queen beds). Twin has its own private bath and queen bedrooms share a bathroom. Small cottage on property (not available for rent) with their own private patio. Separate entrance away from main rental house. No access to your yard. Small private, quiet, clerical basement office of owner on side of the house that is not seen or used by renters (hours are Monday -Thursday, 10am - 3pm - beach hours), when renters are at the beach. In 15 years of rentals, it has never been an issue for tenants. Tenants are unaware of it's existence! Owner has lived on the Island for over 40 years and understands how important coming to the Island to vacation is. It is not just a summer rental that is opened up and smells musty! This house provides a welcome feel and is immaculate and well appointed. This is a year-round home that has all conveniences. The owner wants you to be confident that everything will be ready and waiting for your arrival. The house is located in a quiet neighborhood (off-the -beaten path) where there are just 8 homes (mainly summer residents). You feel as if you are out-of-Town, but are really in-Town. She chose this property for herself for this same reason. It has little traffic and one side of the house has a white clam shell covered road. There are not many of them on Nantucket, so this is special. There always seems to be a nice breeze on the property, as it is on a hill. The house is mainly decorated with a clean white background accented with the colors of the surrounding Nantucket waters (sea foam and turquoise). Collections of shells are found throughout the house. The back deck is shaded by a roof and has a hanging porch swing for relaxing. There is a white wicker table and chairs and a BBQ grill nearby. Dinners on the deck are wonderful. Yard has Adirondack chairs and an umbrella for shade. Shade is also provided by the cherry tree in the perennial garden and privacy by 5 foot tall privet hedges surrounding the property. Each room is decorated in a unique style with many pieces found at antiques fairs locally and in Paris. Attention to detail is a strength to assure that your stay is memorable. A booklet will be in the house offering helpful suggestions and local magazines, which the owner's publishing company produces . toilet, Off of Laundry room downstairs. All bathrooms have full shower (upstairs baths have tubs). Convenient outdoor shower for rinsing off from the beach. Great for morning showers with the sun shining down on you and the birds singing. Just a 5 minute walk and you will be in the heart of downtown with shops and restaurants. You will be staying in a home that is away from the hustle and bustle but be close to everything. Best place! Bike paths to beaches are nearby. Bike companies will drop off and pick up bikes. Bus stop a short walk away near historical windmill or can get in Town. they can take you to the beach. There is so much to do on this little island, not just beaching. Just walking to Town you will pass by historical sea captain houses and beautiful gardens. The wharf area has shops and restaurants. On a private shell lane with minimal traffic - ideal if you have children and would be worried about street traffic. Quiet, with just 8 houses in the area. Just the sun and birds will wake you up. Quaint, local Island, seafaring, very historical town. Many historical attractions and museums (lightship basket, whaling and ship wreck), high quality restaurants and shops just a short walk away. No land line, bring cell. Freshly laundered with beds made for your arrival. Gas - turned off in the summer. 4 burner - induction glass cooktop with special Cristel (French) pots and pans. Stone counters, electric induction cooktop, convection oven. SubZero refrigerator and Meile dishwasher. Eat-at counter with 4 chairs. Kitchen located right off of the back covered deck. Seats 8 + (with leaves added to table). Located in pantry closet. Perennial gardens with a large market umbrella in yard over Adirondack chairs. Peaceful, shaded get-a-way for quiet reading. Kayak rentals at multiple places on the Island, with some of them at the beach. Kayak guided tours also available. Multiple bike rental shops which offer free delivery and pick-up on departure. Boat rentals in Nantucket Boat Basin (motor boats), kayak, sailboat, windsurf and paddle boards for rent at local shops (there are many of them). Mahogany deck with cathedral roof. Public and private courts available. 19 hole public golf course nearby with restaurant. Able to get a wheelchair in easily, but there is no ramp. There are 2 wide steps up to the back deck and then you can roll into the house. Master bedroom is on first floor, easily accessible by wheelchair. Shower is open-concept and shower chair can easily roll into it. This is a year-round house which the owner rents in the summer. It is NOT JUST a summer rental. Well appointed, just walk in an enjoy your vacation. A nice quiet summer community of just 8 houses. Minimal traffic. Five minute walk to Town and bike paths are nearby to Surfside and Madaket. Ideal for teenagers to go to Town and for family with baby carriage. Wheelchair can get up onto the deck and into the house (it is not a ramp, but one low wide step to the deck). There is a master bedroom and full bath on the first floor, where an elderly couple could stay. Master shower is wheelchair accessible as it is open entry - no door. Impeccable home conveniently located walking distance to Town and central to all key beaches. We’ve stayed at this gorgeous home for three years in a row and would highly recommend it to anyone. This serene oasis is perfectly situated just outside the hustle and bustle of Town. The house is just the right size for a family of 4-6 with 4 bedrooms, 3 full baths and an outdoor shower. The interior is impeccably decorated with modern stylish appliances and furnishings that mimic the natural beauty of Nantucket and clearly had the influence of a professional decorator. The majority of the interior is bright shiny white with copious accents of teal, celadon and robins egg blue. The floor and staircase are painted in shiny bright white, so no shoes are allowed in the house and you must be very careful with suitcases. The house is always perfectly clean when we arrive and the beds, linens and towels are all top notch. We can’t say enough about this home other than it truly offers a little slice of heaven on the magical island of Nantucket. Thank you for such a nice review! As you know, I am always so happy to have your family stay here and know that it has, yet again, made special memories for your family. You are welcome anytime! 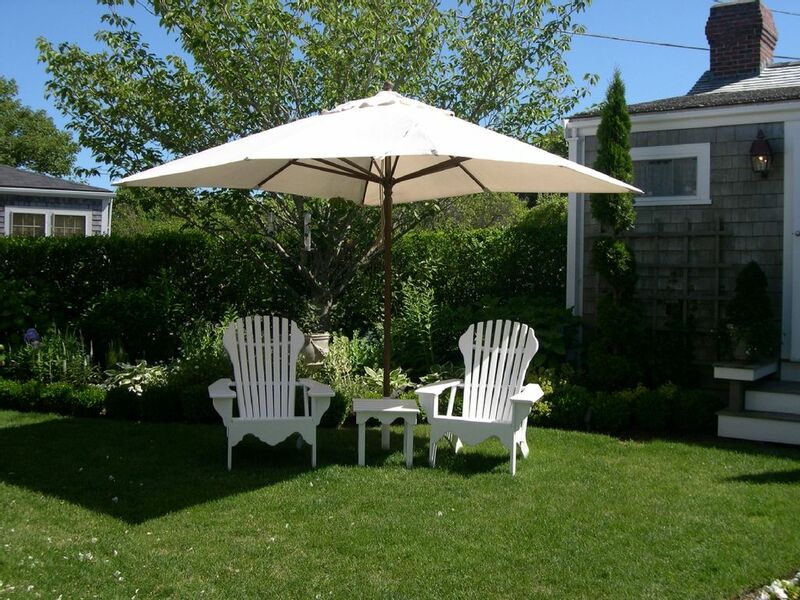 The house is a large, traditional Nantucket house that is immaculate. It's a short walk to the center of the town, but located in a quiet area where there are no noises from traffic or noisy neighbors. The owner is very friendly, and was very helpful in providing us information about the island, things to do, places to go, etc. Overall, an excellent experience. House is located on a quiet shell lane in-Town, just a 5 minute walk to historic cobblestoned Main Street. A car is not necessary to get to Town. You will want a bike or car to get to the beach. Convenient to restaurants and shops and easy for teen-agers to "be on their own!" One bike path from the house will take you to famous Surfside Beach where there is a large beach with some waves. I also has bathrooms, a shower and a snack bak. Another bike path, a short distance from the house, will get you to Cisco Beach (the surfers beach). A farmer's market, brewery/winery and fish market are found on the way to this beach. In the other direction, towards Town, you will find many beaches, shops, bike rentals, restaurants, theaters, art galleries, docks and boat lines. Always something to do and see!